A Top Gun for the Hornet generation? You are at:Home»Aviation»A Top Gun for the Hornet generation? A sequel to the smash 1986 movie that provided a soundtrack for a generation of naval aviators and turned Tom Cruise into a star might be in the cards. According to the Hollywood Reporter, Paramount Pictures has made offers to the original producer and director of “Top Gun” to produce a sequel. According to the paper, Cruise would be expected to make an appearance as Maverick, the hotshot F-14 Tomcat pilot who bends or breaks the rules in his constant efforts to be the best. 1. Hollywood LIVES on sequels. How did this not happen 20 years ago? 2. 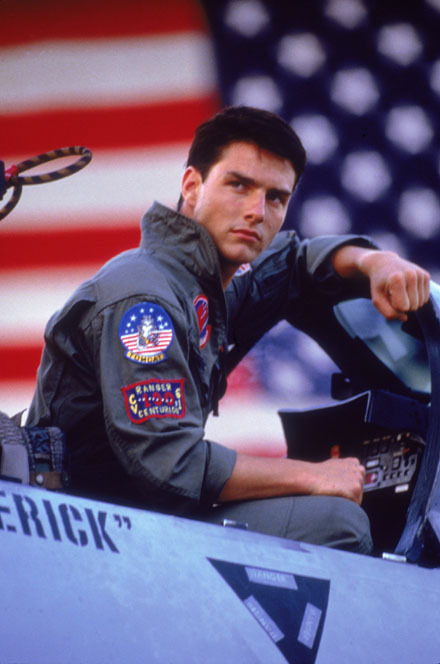 If Maverick were a real person, what would he be doing now? Wearing stars? Leading NavAir? Cashing in contractor paychecks? What do you think? Unfortunatly, he would probably be a CAG at the very least, and possibly, have a star leading some high profile program in NAVAIR. Personally, I think he would have been a JERK to work for, and the maintainers would have HATED him. He would have had the WORST score in bombing competitions because the AO’s or AT’s would have “fixed him up”! Maverick claws his way to an O-6 and squadron command slot following the Mig-28 shootdown but never gets another kill, despite GWI and II. His string of bad FITREPs follows him, as he never loses that cocky overconfidence, most notably, a hushed-up drag race on the Pell bridge between himself and the French Navy representative during the Senior Officer’s course in Newport. Charlie’s career is trampled from the sheer number of PCS changes and ejects from their relationship. Following an incredible washout at Plastic Bug conversion school, he briefly becomes an adversary instructor at ATAC only to end up in Somalia training TFG flyers A2G techniques using newly bought Embraer Super Tucanos. I get that Hollywood lives on sequels but honestly, some things just need to be left alone. Top Gun was fun, became a classic and should just remain so. To try to ‘reboot’ it and launch a continuation of the story, just feels like Hollywoods next desperate attempt to make money as oppose to something new, artful and innovative. You never know, could have been a naval version of John Boyd, yea right! Looking at the character of Maverick, if he were still around in Naval Aviation he would be a contractor. Mav never liked the chain of command when he was a LT, why would he like it more being tied to a desk as an Admiral? He is nowhere near political enough to advance that high. He would fit in well as a contractor where he could speak his mind a bit more. If they are looking for realism I suggest they look to Ward Carroll (Retired Tomcat RIO turned author) for script assistance. Ward has a way of putting realistic naval aviation scenarios on paper while developing good characters. I can see TC as a retired naval aviator Commander, who did his 20 and was told to do no more. Now he lives outside of NAS wherever, fixing up and flying old stunt planes, and riding his motorcycle (tho he’s switched over to a cruiser, since ninjas are for younger fellows). Brash young Lt comes to today’s version of Top Gun school, coincidentally held at same NAS that Maverick lives near, and runs into trouble. Captain Iceman suggests to young Lt that he go talk to an old aviator friend of his, and Mav finds himself staring at a younger version of himself. He takes young Lt under his wing, and teaches him, much the way that a Jedi trains a young padewan. If you really want to throw a wild card into the story (since, in reality, it’s been about 25 years since Top Gun was made), make the brash young Lt the long-lost son of Maverick and Charlie (Charlotte Blackwood), who kept the birth of their son a secret from him, after their relationship flamed out (shortly before she discovered she was pregnant). Now THAT would make a great story line! !